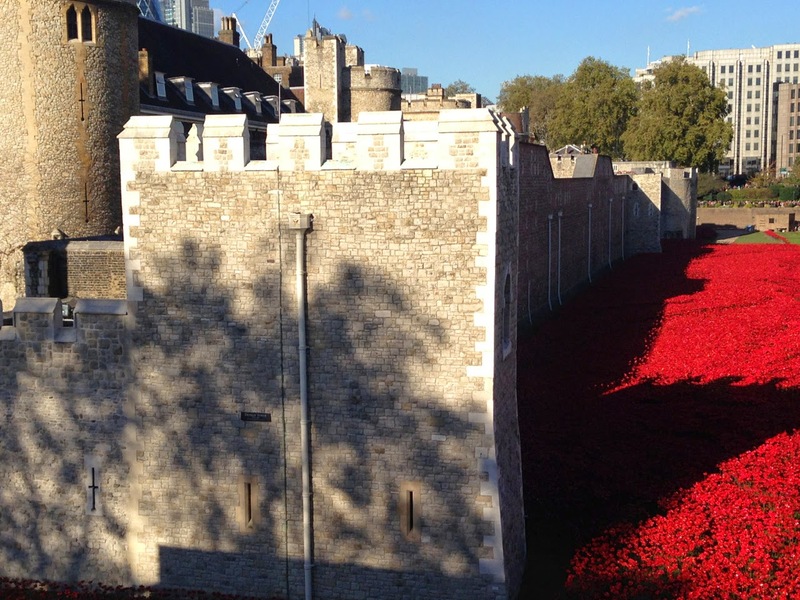 I went back to the Tower of London this week to revisit the poppies. I went for a few reasons. First, because I wanted to see how the installation had grown since I last saw it. 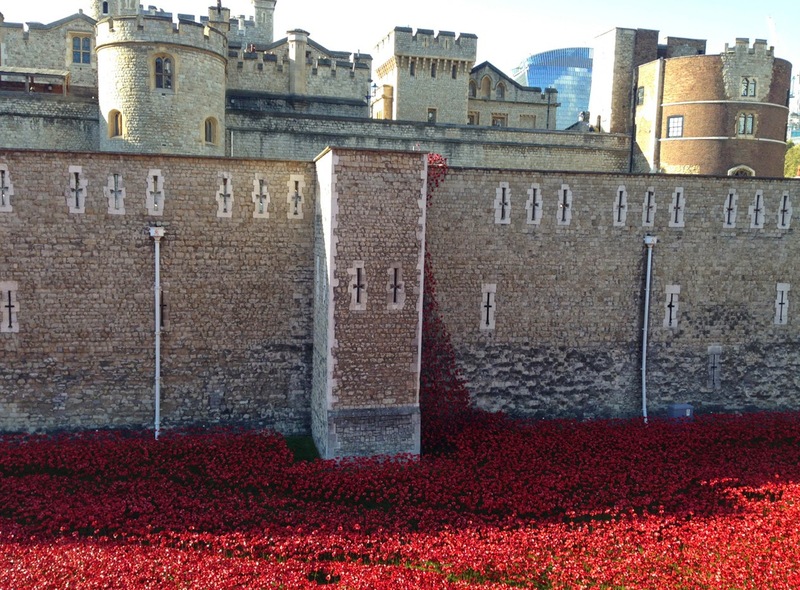 Second, because the poppies have become a realio, trulio PHENOMENON of their own. 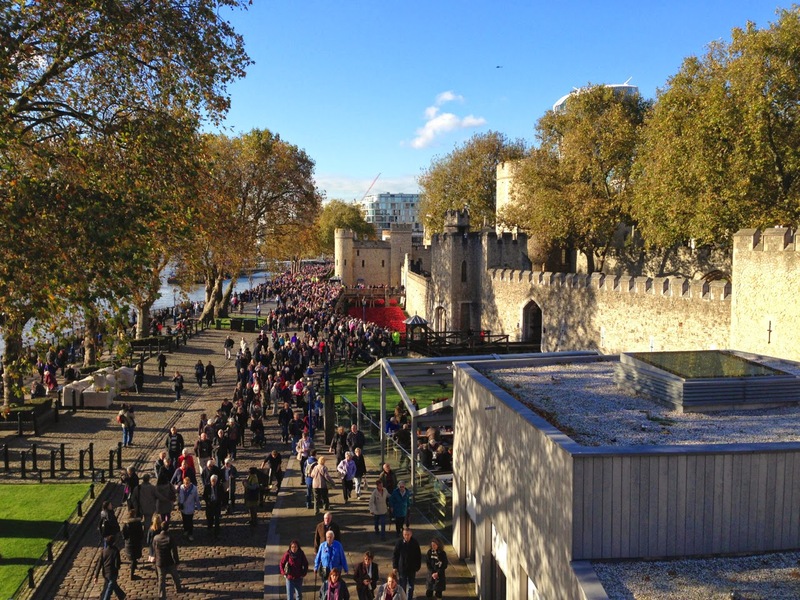 Everyone, from the Guardian’s art critic Jonathan Jones (‘prettified’, ‘toothless', ‘inward looking’), to Boris Johnston (‘awe-inspiring’, ‘global visitor attraction’) has weighed in and every day, crowds of people stream across Tower Bridge and round Tower Hill to see for themselves. 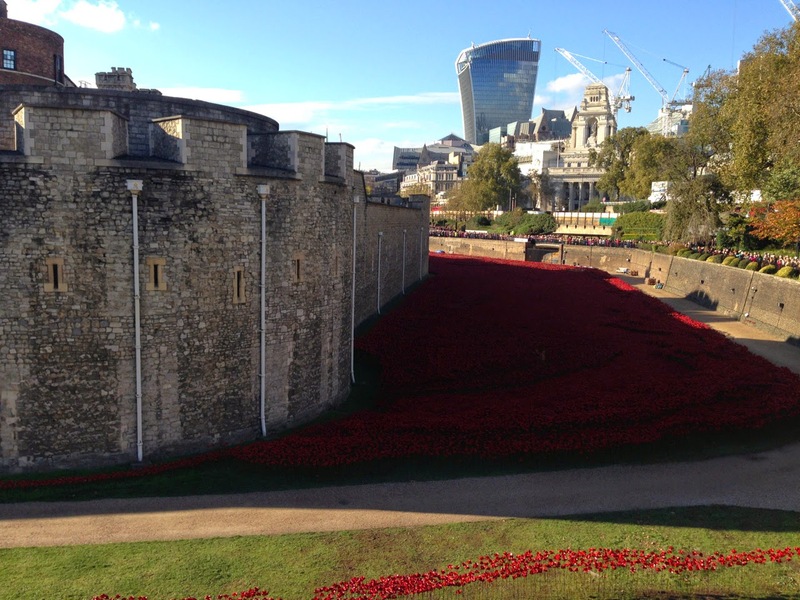 The sea of poppies has indeed grown since September, and the poppies almost fill the space between the Tower’s outer perimeter and the main wall. I was struck by how well the installation works as a visual statement: the sweep of vivid colour against the monochromatic stone draws your gaze. It’s simple, powerful, and – crucially – looks amazing in photos. 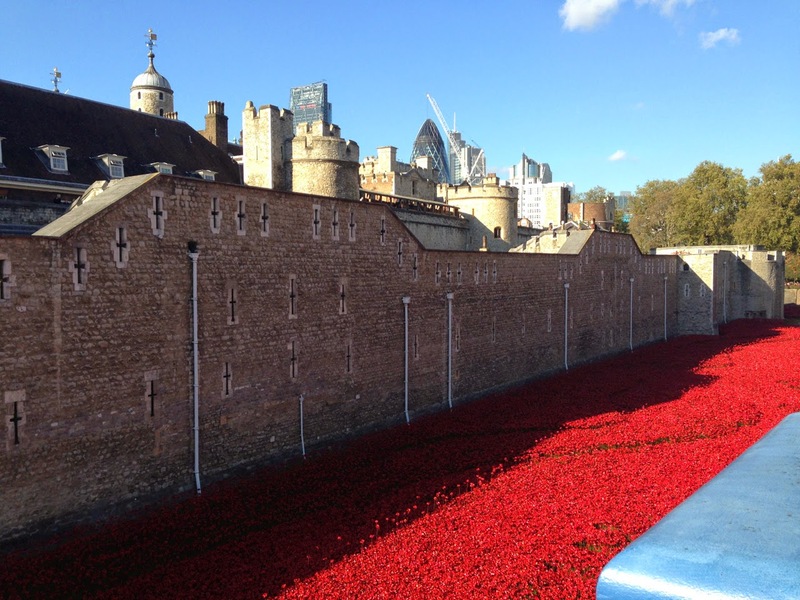 But while simple, the installation isn’t simplistic and it’s doing it a disservice to suggest the poppies have been popular because they appeal to the lowest common denominator. Every time I look at this flood of red I remember the title of the work: ‘Blood Swept Lands and Seas of Red’. From a distance, it does almost look like the Tower is surrounded by a blood-filled moat. 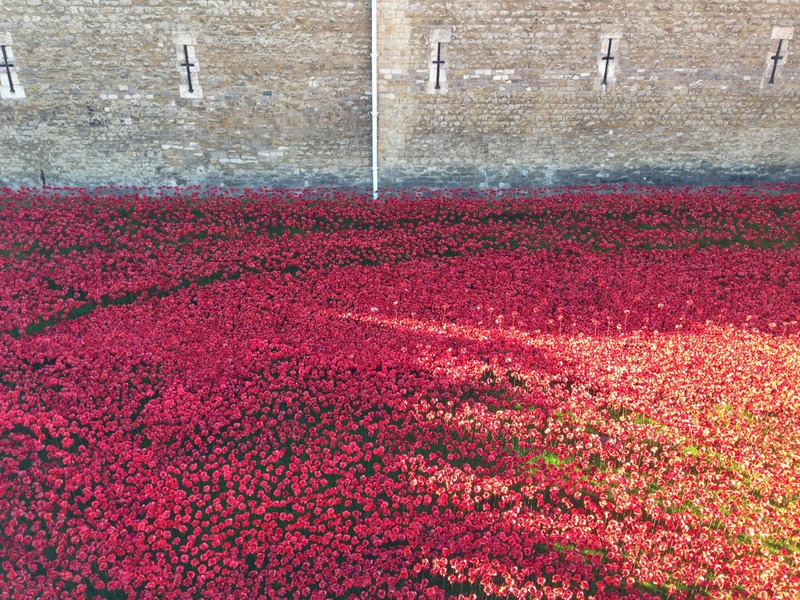 I think, too, that we are always moved when we see evidence of war narratives being shown to be composed of individual stories: a poppy for every dead soldier. That said, the effect of this is, for me, diluted by the fact that the poppies do produce something of the effect of military graveyards: all those serried ranks of identical white crosses, all those identical red poppies. I think Jonathan Jones made a valid point that a fitting testimony to the dead of World War I would represent all of the soldiers who died – not just the British combatants. But that memorial would have looked very different. 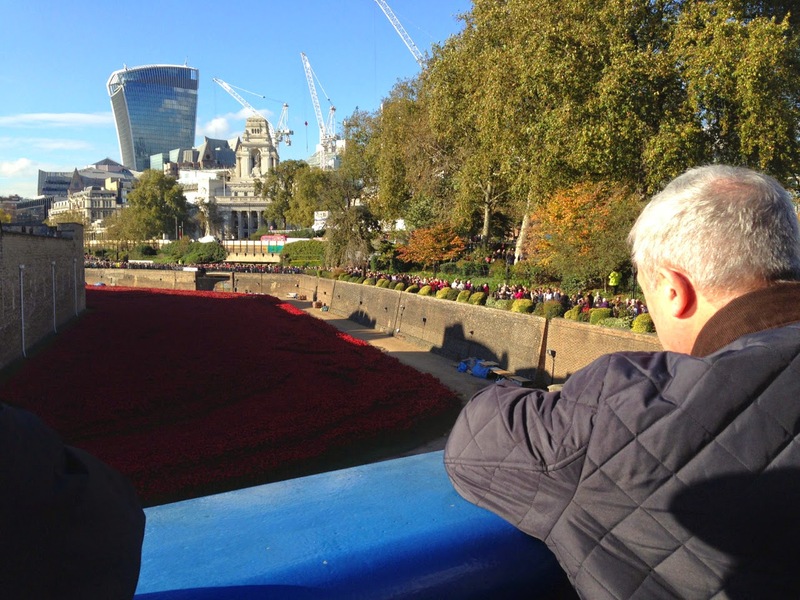 Because what struck me as I walked across Tower Bridge this week is that almost every person was wearing a poppy pinned to their coat. It is a quintessentially British symbol and this is a quintessentially British memorial. Given my general pro-poppy stance, you might be wondering if I’m also wearing a poppy this November. I did consider it. I thought that maybe in what politicians like to call the new era of British-Irish relations I could embrace a symbol that has a difficult and unhappy history in my homeland. I thought that wearing the poppy might be a way of honouring my Great-Uncle Jim, who served in the Royal Artillery and died in Northern France in 1917. I remembered my ‘your people shall be my people’ approach to ANZAC Day. In the end, I decided it still doesn’t feel right for me. But, on Sunday, the Irish Ambassador will lay a wreath on the cenotaph in Whitehall as part of the Remembrance Day service. And that feels right.